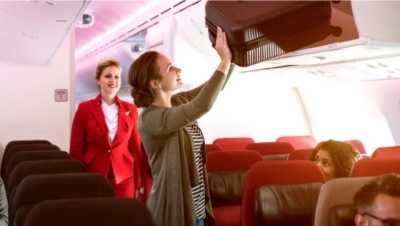 Virgin Atlantic launching ‘hand baggage only’ and ‘Economy Delight’ fares – what do you get? Not long ago we wrote about BA’s new ‘hand baggage only’ fares on transatlantic flights starting in April. Passengers will have the choice between the regular Economy fare and the newly introduced Basic Economy fare which does not include hold luggage and seat selection. Now Virgin Atlantic has also announced changes to its Economy fares as part of a multi million pounds investment in their Eonomy product. These fares will launch in ‘Spring 2018’. Full details are on the Virgin Atlantic website here. Like BA, Virgin Atlantic will offer a hand luggage only fare but will also give passengers the option to choose a seat with extra legroom. You can only upgrade to Premium Economy if Virgin Flying Club is offering miles redemption seats in that cabin. It is not an automatic right for anyone who has enough miles. Economy Light could be risky for anyone not travelling alone as you could be separated at check-in and placed in middle seats in different parts of the cabin. Families have more protection as a child must be sat with one parent under CAA rules. A family group of two (parent and child) is guaranteed to be kept together. Other changes include the addition of USB charging points to every seat on every aircraft and access to high speed WiFi on every route (Virgin will apparently be the first European airline to have wi-fi on 100% of its fleet by the end of 2018). The ‘host of innovations on the ground’ include automated bag drop kiosks at London Gatwick and London Heathrow. Gatwick will get four kiosks this Summer and Heathrow will follow with 18 kiosks this Winter. That Virgin Atlantic would introduce a hand baggage only fare on long-haul flights was just a matter of time. You can’t blame them. With Norwegian leading the way in lowering headline fares by charging extra for luggage, seat selection and food, the legacy carriers had to follow in some way. You can lose a lot of business if you don’t appear at or near the top of Expedia’s flight search results and that means unbundling your product to reduce the headline price. Virgin and BA will still offer more for free with their ‘hand baggage only’ fares than Norwegian or Primera (the latter has extortionate meal prices for example). 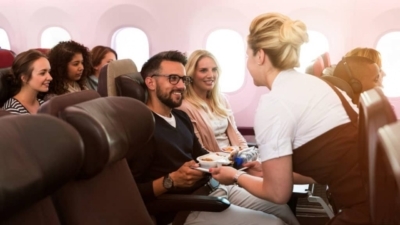 Economy Delight, pictured above, sounds like a good option if your budget doesn’t stretch to fly in Premium Economy but a bit more legroom and priority check-in and boarding would be welcome. So Economy Delight looks like a rebranding of what used to cost you from £40 extra each-way with some extra perks added like premium check-in and priority boarding. It does look, however, as if Virgin Atlantic will add a number of seats with more legroom on some aircraft. Where other airlines are trying to squeeze in more seats by removing toilets and reducing seat pitch as seen with the change to the BA 777 fleet, Virgin Atlantic is trying to go a different route. The B787 fleet – should Rolls Royce ever get the engines fixed – will be losing six economy seats to make room for more Delight seats. 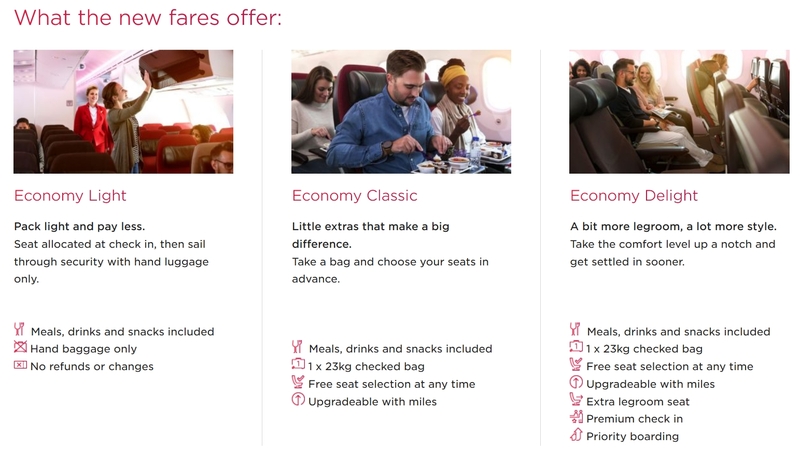 It will be interesting to see how much more passengers will have to pay to fly Economy Delight rather than Economy Classic and how it compares to the current ‘from £40 each-way’ upgrade price, which does not include premium check-in or priority boarding. You can find full details of the changes on the Virgin Atlantic website here. OT , my spider senses tell me another QR Sale can’t be far away (2-3 weeks) any QR ads booked Rob? the Virgin images are a little misleading – economy classic looks like food is the perk. this is in included in basic. then delight has been shot to look like wider seats (3 behind in classic, and then ohh 2 across in delight!) also not the case. OT: If I (AMEX Platinum) refer a friend for the AMEX SPG (they’ve never had it before), and they already have the AMEX Platinum, will I receive the 18k refer bonus? The Terms don’t suggest otherwise, but perhaps someone with experience may be able to help? Thanks. OT – my apologies. I’m looking at flights in J from NYC to VIE. On the Iberia site, I’m quoted 56,000 Avios and £130 for Business to LHR and Economy from LHR to VIE. On Avios/BA, it’s 65,000 plus £360 for Business all the way. Does anybody know why there is such a discrepancy in the taxes part (I thought this was only true on Iberia metal) and, more importantly, whether I can still cancel the flights if I book via Iberia? In an earlier article I found via Google, Rob said that you can’t cancel BA flights booked via Iberia, but the Iberia site says you can, so I don’t know if the situation has changed since the earlier article. Cancellation rule has changed for BA but not for other oneworld partners. Can’t explain the taxes UNLESS it is something to do with the transatlantic JV treating all flights as IB even if not? Excellent. So it is refundable – I’ll go for that! Thanks! Could someone please explain how you can get 18,000 points for referring Spg Card From Holding Platinum card ? Is this also possible if you have held the card before if its longer than 6 months ago. I thought you normally get 5,000 Spg points for this referral. the applicant can switch to SPG while applying and you do get the same 18000 MR bonus. Does this work if you have held the card before in my case 8 months ago . My partner has Plat and so he would refer me . After 6 months of cancelling you become eligible again for the sign up bonus. This has already happened, in September 2017! Sorry for so many questions fairly new to this . Does it also apply if we do the same but apply for Ba Premium card Not SPG card . I.e 18,000 MR points for referral from Platinum card but then apply for Ba Prem Card. yes; any referral from Platinum. The Platinum Card gives you 18k points on any card referral (BA, SPG, Nectar, etc.) except for the basic free Amex card. Could i refer myself from my platinum for the BAPP? Is self Referral allowed By Amex ? One for Rob as I don’t know what the answer is, but everyday the majority of comments and questions are always centred around Amex and referrals….what can and cannot be done, and numerous ‘what ifs?’ Maybe a dedicated daily topic, (one of the three perhaps), dedicated to this subject ? I cannot publicly write about much of this because it would breach the terms of my FCA licence. Fair enough, but there is obviously a huge amount of uncertainty around this subject which generates a lot of overlapping questions every day. No easy answer I guess, but gets a little frustrating at times, particularly when folks can’t be bothered to at least try and do a search or plough through previous comments/answers. Maybe if there was always a Bits article and people could be nudged to use that for OTs it would help a bit. Another group of passengers get priority check in and boarding? Surely there must be more priority people now than not!? OT – I opened a Virgin Money ISA Stocks & Share in on 11/10/17 with the first payment made on 24/10/17 and subsequently have made £100 payments monthly, my 6th payment will be on 24/3/18. I cannot recall the T&C whether if you cancel after the 6th payment, the miles that i got as part of the promotion are safe? Economy Delight combines well with an Amex Plat for those without status. OT but Virgin Atlantic related. The option to transfer AmEx Membership Reward point to Virgin miles has disappeared from my list!? Anybody else has the same, I’ve transferred some points ~2 weeks ago. Hmmm, it has disappeared. I will chase. EDIT: Is only temporary, will be back later. Emirates and Delta are also down – not coincidentally these are the 3 programmes where transfers are instant. They’re doing main between 0800 and 1300hrs today, it’s posted on the rewards site. Noticed that a LHR-LAX economy return at the end of June has gone up by £80 overnight as the website moved from the old regime to Economy Classic with no Economy Light seats for sale on the dates selected.